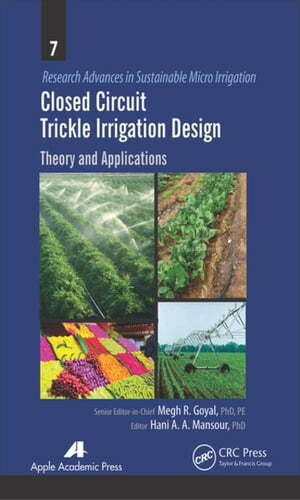 Collins Booksellers - Closed Circuit Trickle Irrigation Design: Theory and Applications by Goyal, Megh R., 9781498724371. Buy this book online. Closed circuit trickle irrigation is a form of micro irrigation that increases energy and water efficiency by using closed circuit drip irrigation systems designs. Modifications are made to traditional micro irrigation methods to reduce some of the problems and constraints, such as low compressor water at the end of irrigation lines. This approach has proved successful for the irrigation of fruit trees and some vegetable and field crops. Closed circuits of drip irrigation systems require about half of the water needed by sprinkler or surface irrigation. Lower operating pressures and flow rates result in reduced energy costs, and a higher degree of water control is attainable as well. Plants can be supplied with more precise amounts of water, and disease and insect damage is reduced because plant foliage stays dry. Fertilizers can also be applied through this type of system, which can result in a reduction of fertilizer and fertilizer costs. This new volume in the Research Advances in Sustainable Micro Irrigation book series presents a diverse collection of research on closed circuit irrigational technology and design and provides studies of its use on such crops as wheat, maize, yellow corn, soybeans, rice, and snap peas.